Pre-saturated wipes for general cleaning applications. Cleaning solution comprises 70% Isopropyl Alcohol/30% De-Ionised Water. Excellent for tape head cleaning, removal of fluxes, light oils, polar soils and white mineral residue. Features low-residue formulation and rapid evaporation. 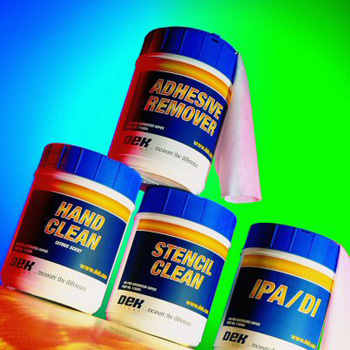 Ideal for cleaning PCBs, microwave and telephone circuitry, data processing equipment, relays and fibre optics.